One of the results of the victory of the Glorious Revolution (1868, lead by General Prim) was the demolition of La Ciutadella. This citadel was constructed by the engineer Joris Prosper Van Werboom in 1715 to dominate Catalonia's capital, once conquered by King Philip V. People were relieved with the demolition of the ominous Tower of Barcelona, where the Spanish monarchy imprisoned and eliminated their enemies. The vast space, a little less than thirty hectares, was yielded to the city and destined to be public gardens, symbolising the liberation of the subjects, now turned into citizens. The Town Hall entrusted the project to the master builder Josep Fontserè i Mestre, originally from Riudoms and protector of the young Gaudí, who was helping him as a draughtsman in his office. Gaudí was nearly twenty-four years old when he presented the project of the fence May 30th, 1876, which Fontserè signed. That year his mother and brother died. It was also when the Third Carlist War (1872-76) ended, in which Gaudí, still a student of architecture, did his military service. 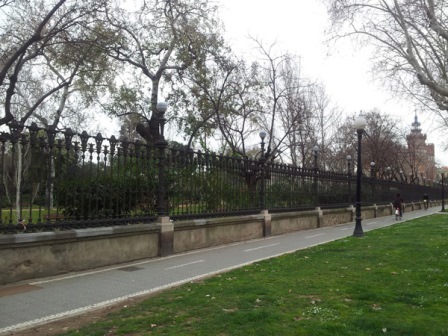 The fence is 1 km in length, has 132 cast iron bars and seven gates: one to Princesa’s Street, three to Passeig de Pujades and three to Passeig de Picasso. Each column on the gates measures 9 m high and has 3 auxiliary columns of 4 m.
The three principal gates are illuminated by chandeliers with groups of six gas flames in spherical globes of white crystal (today electric). They have the shield of Barcelona, crowned by the helmet of war of James I the Conqueror, with its characteristic winged dragon, a symbol that Gaudí would often use in the future. Each big column weighs 8000 kg; the small ones, 2500 kg; and the bars, 600 kg. The smelting was done in the «Nueva Vulcano» and the construction in Marià Rifà i Rumeu's workshops. The total cost of the grid and the gates was 250.000 pesetas. At the beginning of 1885, the gates were completed by the statues of Industry and Trade (by Venanci Vallmitjana) and Agriculture and Merchant Marine (by Agapit Vallmitjana). 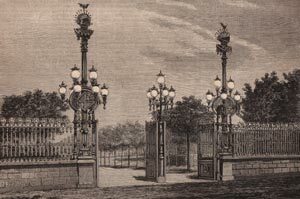 The gates of the park of La Ciutadella were a tourist attraction during the 19th century. The collections of photography and the guides of Barcelona in diverse languages recommend to visit it.